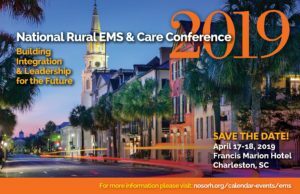 National Organization of State Offices of Rural Health – Join us in Charleston for the National Rural EMS & Care Conference! Join us in Charleston for the National Rural EMS & Care Conference! 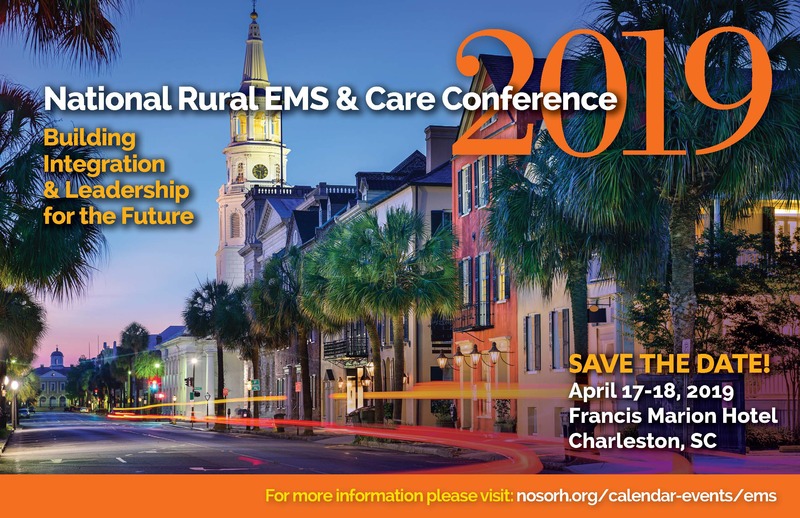 NOSORH, The National Association of State EMS Officials, The Joint Committee on Rural Emergency Care, and the South Carolina Office of Rural Health invite you to join them on April 17-18 in Charleston, South Carolina, for the 5th Annual National Rural EMS & Care Conference. This will be an amazing opportunity to engage with partners from all over the country and at different levels of EMS care! Whether you are a State Office, local EMS provider, state EMS Director, or a hospital administrator, this year’s conference will benefit all who attend with an agenda that features a wide variety of rural and frontier EMS topics. Some of the many areas being considered include developing a high-performance EMS system in low-volume rural areas, how State Flex Programs, EMS directors and State Offices of Rural Health can work together, how FQHCs and RHCs are promoting introductions between EMS and other partners, and maternity/delivery care. The conference will also be expanding by offering a set of breakout sessions, providing attendees more options and time for discussion on specific topics. Invited attendees include rural EMS directors, medical directors and officers, rural health care providers, state EMS officials, state rural health officials, hospital administrators, elected officials, federal agency officials, and other EMS partners. To reserve a room call: (843) 722-0600 or 1-(877) 756-2121 or click here. For more information about the conference as it become available, click here.